Representing Antares Yachts, PDQ Yachts and Camano Trawlers. 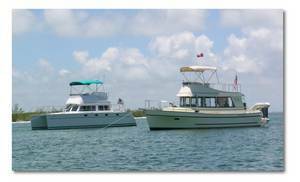 Rhumb Line is the only boat dealership who specializes in Antares and PDQ Yachts. Our knowledge of Antares and PDQ catamarans, their design philosophy and construction methods, combined with our strong relationship with the factory and the vibrant owner’s groups, puts us in a unique position to help you find the right yacht for your cruising needs. Based out of southeast Florida in the Stuart/Palm City area, Beth and Ross can offer a buying or selling experience not usually found in the market today. Their personal interaction, knowledge of the product and real-life cruising experience makes choosing Rhumb Line as obvious choice for your buying or selling needs.